Are you the parent of a child (aged 10 – 19 years) with diabetes? Then we need YOU! And your child with diabetes too. You may remember that a few years ago now, the Diabetes MILES survey was conducted. Diabetes MILES looked at the psychological health of people living with diabetes, and the survey results continue to be collated and presented. 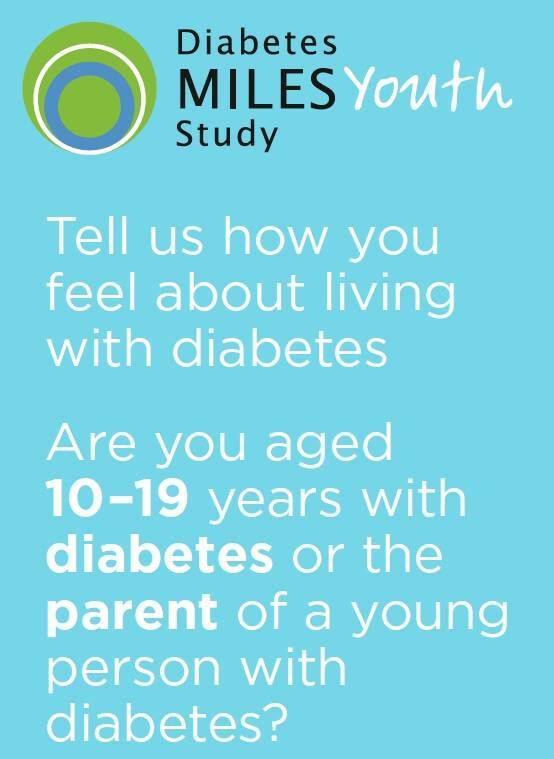 Now, a new study – Diabetes MILES Youth – is being conducted asking young people about what it’s like to live with diabetes, and how diabetes affects their wellbeing. And because we all know that diabetes is a ‘family sport’, parents of kids with diabetes are also being asked to complete the survey. Diabetes MILES Youth is part of the NDSS-funded Young People with Diabetes National Development Project of which I am the Project Manager. I’m writing about it here because I think it’s really important for as many people as possible to take part in this survey and have their voice heard. The survey is being conducted by the Australian Centre for Behavioural Research in Diabetes.